Update: October 28, 2016 -- The Savvy App Store Submission Checklist has been updated to reflect new requirements for screenshots, IPv6 network support, several iOS 10 features, Human Interface Guidelines for 3D Touch, and considerations for custom widgets. To organize all the moving parts of each app we started to collect all of our knowledge into a comprehensive list to use ahead of each submission. This checklist helps make certain we've covered all of the basic and more complex items that most apps have to address. It positions us to catch more issues upstream, rather than in the weeks before launch. We're releasing this resource because we believe others will find it useful. We also hope the iOS community will provide feedback to make it better. We'd like to see it become a living, breathing resource that will remain helpful for years to come. Want it now and don't care about the details? Go check out The Savvy App Store Submission Checklist. Our first goal for this checklist was to make it as comprehensive and practical as possible. To ensure we didn't get lost in too much detail, we focused on a single platform and all of the iOS-specific nuances most apps need to address before submission in the App Store. This list goes beyond just the functional aspects of an app and addresses additional considerations for user interface and accessibility standards. All of this detailed information is organized in sections by related functions to give your team the opportunity to decide which items to tackle first. These sections also allow different parts of an app team to conduct QA checks on the checklist items they're most familiar with (for example, a designer could tackle the App Visuals section for the team). If you choose the divide and conquer approach, be sure to list the sections covered in the “Tester Name(s)” area. You can use this checklist in a number of ways. While creating a free Quip account will give you the most control over all of the content in the checklist, you don't need Quip to use this resource. The checklist can be exported to Microsoft Word, PDF, as well as HTML and Markdown syntaxes (for pasting in another document). You can print it for offline use or keep a digital copy to interact with. 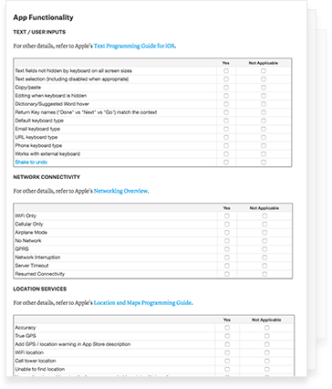 The checklist is formatted in a way that is useful for us, but also easily shareable with the app creator community. We plan on updating it over time as there are new iOS updates from Apple or as we receive feedback from others using the checklist. Though this checklist should generally be used during a final QA push ahead of submitting to the App Store, it can also be useful to review it earlier in the process. An early start can help you make sure you've accounted for various items during the buildout of a new app. This is especially true for the iTunes Connect information, which requires a number of elements to add external testers to TestFlight. Regardless of when you start using the checklist, make sure you have a fresh copy each time you do an update. This lets you have a specific copy that corresponds with what you're testing for that update. Don't just skip the documentation items at the top. Having a clear record of who tested what as well as the submission date will help keep team members accountable and the QA process on track. That also means saving the checklist with a helpful document name. All of these small steps will better enable you keep track of completed checklists and reference them in case something goes wrong once your app is live. While it's one of the checklist items itself, it's worth highlighting that a fresh installation of your app should be the easiest to test. You will also want to test against an upgrade from the current live version in the App Store (e.g., upgrade to 2.0 from 1.9). Even though many more people auto upgrade to the latest version, you will probably also want to test an upgrade from a previous App Store version (e.g., a 2.0 app is upgraded from 1.1) just in case. We'd love to hear your feedback on how to improve it or how you've integrated this checklist into your own QA process. Be sure to keep in touch on Twitter for updates, including announcements when we release a similar list for other platforms.